Jerry Seinfeld performs at the very spot that put him on the map as a struggling young comic in the late 70s. A nostalgic look back at his early life and career in the New York City of the times, in all her gritty glory. In the Netflix comedy special, Jerry Before Seinfeld, the legend himself returns to the NYC nightclub, The Comic Strip, for a walk down memory lane in which he shares old and new material, standing in front of the now-classic red brick wall. The film also contains vintage home movies and actual footage of his early work, including the seminal 1981 Tonight Show appearance which catapulted his career. It’s a comforting and nostalgic memoir from one of the most successful entertainers in the world who has somehow managed to today reflect his hometown roots, stay normal, and still be very much the well adjusted kid from an average suburban family. It’s also an intriguing procedural on the process of being funny. The devil’s in the small stuff, as it turns out. These days you can’t throw a rock without hitting some show or documentary about the history or analysis of Comedy as an Art Form, and to further dissect it according to gender, religious affiliation, or political ideologies. But back when Jerry Seinfeld was just beginning to establish himself as a new talent to watch, his contemporaries weren’t compartmentalizing themselves or their routines. People like Steve Martin, David Brenner, David Steinberg, Joan Rivers, Robert Klein, and Andy Kaufman were just plain funny. And when the show, Seinfeld, took off it was the perfect vehicle for the absurd observational humor the comedian had cultivated based on the small moments of family life, dating, jobs, etc. It, like the comedian himself and his routine, was also about living in New York City, a place chock full of ‘characters’ where all you had to do was look around and there was your comic material. The ‘show about nothing’ that found its hip young audience at the juncture between adolescence and adulthood, is now considered classic television. Jerry Before Seinfeld is a genial reminder of those days as well as a glimpse into the sheer industry and determination it took to master such an effortless style. This kid really did his homework. 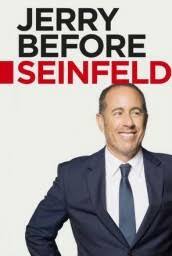 Jerry Before Seinfeld is presently streaming on Netflix. We watched this last night, Norma…laugh out loud brilliant! thanks for the recommendation!